Personal injury is a blanket term that is used to describe an injury to a person. In legal terms, personal injury is the term used when referring to injuries that were caused by the lack of care or negligence of another person. If negligence is present, the injured person can usually pursue a claim for the damages and injuries they sustained as a result of the accident. New Jersey allows injured victims to seek compensation for damages that are related to costs of their injuries, pain and suffering, lost wages and more. This will help to alleviate some of the monetary issues and help with the emotional trauma that occurs when a person is injured in an accident that was no fault of their own. Personal injury can include a wide variety of injuries that range from automobile, motorcycle, truck and pedestrian accidents to spinal cord injury, traumatic brain injury, slip and fall injury, medical malpractice and wrongful death. These types of injuries can range from minor to catastrophic in severity and require expensive and extensive medical treatment which may interfere with a person’s ability to work and lead a normal, productive and healthy life. 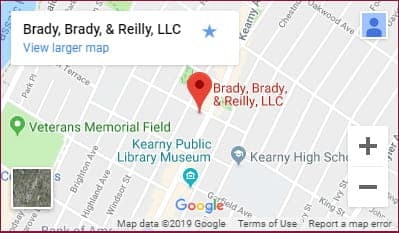 The well-respected and knowledgeable attorneys at Brady, Brady & Reilly, LLC are well-versed in handling all types of personal injury claims for accident victims across the state of New Jersey. Our dedicated and trusted personal injury attorneys work diligently to assist clients with car accident claims, as well as claims for various types of personal injuries. Our team of experienced attorneys help those who have suffered serious injuries in a variety of accidents caused by other’s acts of negligence. The lawyers at Brady, Brady & Reilly, LLC have helped numerous clients successfully with cases involving catastrophic injuries and wrongful deaths obtain the compensation and justice they deserve. If you or someone you love has been injured in an accident that was caused by another person’s negligent or reckless behavior, contact our law firm to discuss your accident and find out if you have the right to pursue a legal claim for your losses and damages. Our team of trial attorneys at Brady, Brady & Reilly, LLC has had great success in handling an extensive variety of personal injury cases for clients across New Jersey. We work diligently to help clients protect their legal rights and get the compensation that they are entitled to for their injuries. Back Injuries: Suffering a back injury can have a devastating impact on a person’s life. These injuries often severely limit a person’s ability to function normally. Back injuries often require surgical treatment and extended recovery periods to overcome, and in some cases, back injuries last a lifetime, preventing a person from working or engaging in activities they love and enjoy. We help victims who suffer back injuries due to the neglect actions or lack thereof, get reimbursement for their lost wages, medical treatment, and other damages for their injuries. Dog Bites: Dog bites can be traumatizing, especially to young children, and have a lasting impact on a person’s life. Quite often, these injuries result in severe nerve damage, muscle problems, and they can leave extensive scarring. In addition to physical pain, individuals who are attacked and bitten by dogs often suffer from overwhelming anxiety and posttraumatic stress disorder in the aftermath of their injuries. The mental and physical pain related to dog bites can last a lifetime. We help victims obtain settlements for treatments, mental anguish, physical pain and suffering, and other damages in these cases. Fatal Accidents: Individuals who die due to others’ negligence often leave behind spouses and children to grieve. In cases where fatal injuries occur, we help surviving family members file wrongful death claims to obtain financial redress on behalf of their loved one. Although reparations cannot replace your loved one, it can help alleviate some of the burdens you face from this tragic event. We help wrongful death claimants collect indemnities for lost wages, loss of consortium, pain and suffering, funeral and burial expenses, and various other damages. Head Injuries: Sustaining a head injury can be devastating. These injuries often cause individuals to lose balance and memory, whether temporary or permanent, which can drastically impact their ability to walk, work, or engage in various activities. Head injuries can require extensive medical treatments and often force individuals to go through therapy to regain motor functions. Individuals who sustain head injuries due to others’ neglect can obtain redress for pain and suffering and various other damages related to their injuries. Nursing Home Neglect And Abuse: Having to place a family member in a nursing home is often a difficult decision for families to make. Unfortunately, we are often let down when it comes to others taking care of our elder and sick loved ones. There are many instances where individuals in nursing homes are neglected and abused. Those who sustain injuries or die as a result of nursing home neglect or abuse are able to obtain compensation for themselves or loved ones. We work diligently to investigate nursing home abuse and neglect cases in order to establish solid cases that help our clients obtain the recompense and justice they deserve. Pedestrian Accidents: Pedestrians are at a clear disadvantage when it comes to standing up against the impact of a motor vehicle. Quite often, pedestrians involved in automobile accidents sustain serious and life-threatening injuries that often require extensive medical treatment and therapy. These victims are able to file personal injury lawsuits to obtain restitution for lost wages, medical expenses, pain and suffering, loss of consortium, and various other damages they face in the aftermath of a pedestrian collision. Premises Liability: As visitors, we expect businesses, hotels, and other public buildings and land to be safe and free of defects. Unfortunately, this is not always the case. There are many instances where individuals go to various public properties and suffer accidents that lead to devastating injuries. Whether it is a pool accident, food poisoning, or another type of accident, victims are able to hold the property owner legally liable for all financial losses sustained to their injuries. Product Liability: As consumers, we readily purchase products that we expect to function as intended. This is not always the case. There are instances where individuals are severely injured or die due to defective or malfunctioning products. Malfunctioning vehicle brakes, car fires caused by faulty electric wires, and exploding phones and electronic devices can all cause serious and life-threatening injuries. Consumers who are injured by defective products can claim indemnities for their injuries, pain, and suffering, and various other damages. Rideshare (Uber And Lift) Accidents: Unlike typical car accidents, rideshare accidents are far more complex. Those involved in rideshare accidents often deal with multiple insurance companies that deny liability for injuries to victims. Working with an aggressive attorney from Brady, Brady & Reilly, LLC will ensure you obtain the justice you deserve for your injuries. Slip And Fall Accidents: Slipping on wet surfaces or falling due to broken or damaged ground surfaces can result in serious and debilitating injuries for sufferers. Unfortunately, property owners who neglect their grounds place visitors at an increased risk of sustaining these serious injuries. Slip and fall accidents can cause broken bones, head trauma, damage to the neck, and back injuries, which can all have a devastating impact on a person’s ability to function normally. We help accident victims across New Jersey obtain compensation for damages sustained due to slip and fall accidents. Spinal Cord Injuries: Spinal cord injuries can lead to temporary or permanent paralysis. Those who suffer these injuries are often required to go through months or years of treatment in an effort to gain a sense of normalcy. Unfortunately, a lot of spinal cord injury victims never fully recover from the trauma. When victims sustain spinal cord injuries due to negligent or reckless acts of others, they are able to obtain reimbursement for their medical expenses, lost wages, and various other damages. Traumatic Brain Injuries: Traumatic brain injuries and other types of head injuries can have a serious and prolonged impact on a victim’s life. Injuries to the brain can cause severe neural impairment, vision loss, hearing loss, and behavioral issues. Individuals who suffer head trauma due to the negligence of others often have to go through extensive medical treatment. In some cases, victims have to go through physical and mental therapy to help combat the problems associated with these devastating injuries. We help head injury victims obtain compensation for their injuries, all medical treatments, lost wages, and other damages. Workers’ Compensation: Injured workers are protected by workers’ compensation laws in New Jersey. Unfortunately, companies who provide these insurance policies are quick to deny coverage to those rightfully entitled. We help victims gather evidence and information to form strong claims for workers’ compensation benefits in New Jersey. Workers’ compensation benefits provide restitution for lost wages, medical treatment, and other damages caused by on-the-job injuries. Lost Wages: Those injured by other’s negligent acts are able to obtain money for lost wages. Whenever a victim has to miss work to recover, go to appointments, attend therapy, or undergo surgery, courts enable them to collect repayment for their wages. These are typically calculated by counting the number of hours missed and multiplying it with the hourly wage a victim receives. Lost Earnings: In cases where workers are forced out of work indefinitely, they are reimbursed for lost earnings. These damages are far more difficult to calculate. The skilled and aggressive attorneys at Brady, Brady & Reilly, LLC hire financial experts who calculate lost wages based on a victim’s level of education, employment type, chances of promotions, and expected inflations over their lifetime of work. Medical Expenses: Accident victims often face stacking medical expenses in the aftermath of an incident. Courts award victims compensation for all medical treatments, surgeries, medications, equipment, therapies, and other expenses related to the care of injuries sustained in the accident. Courts review medical records and bills to determine the costs as well as any anticipated treatments over the remainder of a victim’s life. Pain and Suffering: Those who sustain injuries often deal with immense physical pain and suffering. Sometimes, the pain can last for the rest of a victim’s life. Courts take into consideration the extent of damages victims sustain as well as the dramatic impact they have on their lives in order to determine how much settlement they can receive for suffering. Mental Anguish: In addition to physical pain, victims often suffer emotional and mental trauma in the aftermath of their accidents. Victims are able to receive compensation for their mental suffering, therapy, and any other treatment necessary for combating these conditions. Punitive Damages: In some cases, courts award punitive damages to victims who sustain injuries due to severe negligence on behalf of the defendant. These awards are not compensatory, which means no damage has to be proven to collect. Instead, courts award these to victims as a form of punishment toward the defendant for their actions. Our attorneys at Brady, Brady & Reilly, LLC understand the unique challenges victims face in the aftermath of their injuries. We work diligently to ensure victims obtain full and fair settlements for their injuries and damages. The legal team of lawyers at Brady, Brady & Reilly, LLC are dedicated to helping victims obtain the financial compensation they deserve for their injuries and damages. We go above and beyond to ensure each client is personally attended to. Our lawyers work diligently to investigate cases for clients. We collect all relevant documents and records for accident victims and interview any witnesses to gather statements which help bolster their claims. Additionally, our Brady, Brady & Reilly, LLC attorneys help clients by consulting and hiring relevant experts to help create clear and concise presentations representing the scene of the accident and how the injuries impact a victim’s life. At Brady, Brady & Reilly, LLC, we approach and prepare every case is if it is going to trial. Our experience shows us that settlements offers are far better for victims when the other side knows that we are ready and willing to litigate every case. Our approach helps us better serve clients by providing them with the cover they need and deserve in every case. The attorneys at Brady, Brady & Reilly, LLC work diligently to help protect the legal rights for accident victims across New Jersey. We are dedicated trial attorneys who are experienced and knowledgeable on New Jersey personal injury laws. We have over 50 years of experience helping accident victims since 1965, obtain full and fair compensation for their injuries. We have earned a reputation for helping clients obtain the outcomes they deserve for their personal injury cases. If you sustained an injury in New Jersey due to another person’s negligence or reckless behavior, it is imperative to contact our law office as soon as possible to get started protecting your legal rights. We are available at (201) 997-0030 to schedule free consultations and case reviews. Contact us today to get started.